If your idea of heaven is days filled with golf, tennis, and the beach, Prestwick Golf and Tennis in south Myrtle Beach is the perfect community for you. This gated luxury community is built on the incredible Prestwick Golf Course, home to one of the most outstanding tennis facilities in the Myrtle Beach area. Read more about Prestwick Country Club real estate. The community has 24-hour security guards and features four subdivisions of extraordinary homes and condos situated on or near the golf course greens. Wynfield, Highgrove, Pipers Glen Condos, and Manchester Place are some of the subdivisions. 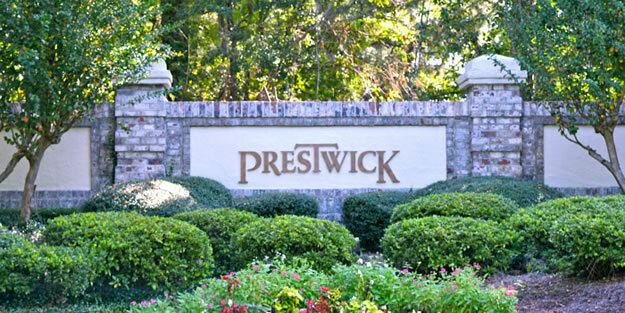 Condos sell for about $200,000 and homes in Prestwick can sell from $300,000 to about $900,000. A recreational wonderland, Prestwick residents have access to an amazing country club with a pro shop, private showers and locker rooms, a large swimming pool, private cabana, and more. The impressive Prestwick tennis complex is widely recognized as the finest in Myrtle Beach, with a pro shop, 2 hard courts, and 11 clay courts. Residents and guests compete in leagues and tournaments. They also host the Identity Adult Tennis Tournaments every year. 18 holes of golf at Prestwick Golf Course are no less perfect. The course was designed by Pete and P.B. Dye, and features exquisite rolling greens, lush lakes, and colorful beds of flowers. The pro shop has a large inventory of designer brands from equipment to apparel. Prestwick Country Club's restaurant specializes in Asian cuisine and is under the supervision of Executive Chef Richard Hartnett who is trained in French, Mexican, Tai, Japanese, Chinese, and Italian food preparation. This is a community designed for those who live life to the fullest and enjoy an active lifestyle. If you would like to see the beautiful Prestwick Country Club homes that are available, call one of our real estate professionals for a private tour.